Earl Grey Park in autumn. Southwest Calgary. Earl Grey Park is the closest bluff to where I live. It is in Mount Royal, an upscale neighbourhood with big houses and big trees, and a few diagonal and curved streets that don’t adhere to the popular Cartesian grid. I first walked through the park on my way to the Phil and Sebastian coffee shop on 4th street. I usually go to their coffee shop in Marda Loop. The light caramel and fruity notes of their espresso are delectable. And their chocolate chip cookies are pretty good too. It is almost November. The leaves in the trees are almost all gone. The cold air, the dry, browning grass and the shrubs with a few shriveled berries and desiccated leaves all scream death. And of course today is Halloween. But it isn’t apocalyptic. The plants are taking a little break. They’ll be adorned with vibrant greens in… um… 6 months. 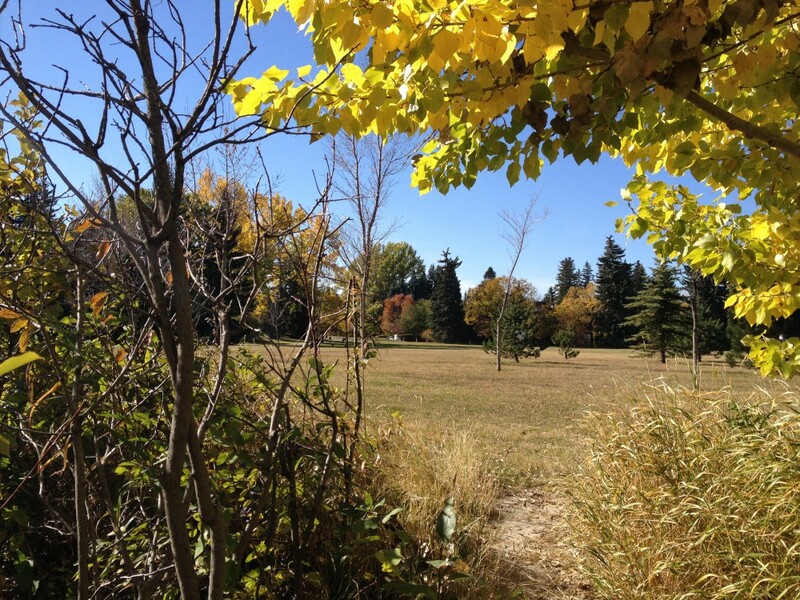 I’ve taken pictures of Earl Grey Park a few times: in September when the poplar trees were green (the dark green of late summer), in October when they were yellow and later in October when the leaves were no more. September 13th, early afternoon (2ish). Some fine stairs. A sea of green, and some man-made stuff. October 8th, early afternoon (2ish). Yellow gold. A tapestry of greens and yellows. Mmm, sunlight playing on colours and textures. Section of trail bordered by trees. A particularly eye-catching stand of trees. A look back. Yellow trees in larger context. October 13th, 8ish. On the way to Earl Grey Park. The early morning autumn colours are delightful. I’m rarely out and about this early, quite a treat. The willow trees were looking particularly grand. The yellow stand of trees from October 8th. They looked even better that morning! Not the clearest view, but the Rocky Mountains are visible in the southwest. I never noticed them before. October 28th, late afternoon (5ish). The yellow stand of trees is yellow no more. The grasses are now much drier. A sea of naked branches. There is something endearing about wild grasses. This view would likely look much bleaker on a grey, cloudy day but it looks kind of pretty in the sun’s late afternoon glow. A house near the park. Giggles.